10 Over-Sized fabric Pockets allow you to category Files, Folders, Magazines, anything in paper form and a proper size. We had a test that each pocket can easily hold 500 A4 papers. The inner 13.5" width and 7" depth is perfect size for regular file folders or legal sized documents. Save your time and space: Maximize your vertical space, 10 over-sized fabric pockets allow you to put lots of File Folders, Paper works, Books, Documents in category. Each pocket measuring 13.5" width and 7" depth, which can hold about 400 papers. It improve your working efficiency. 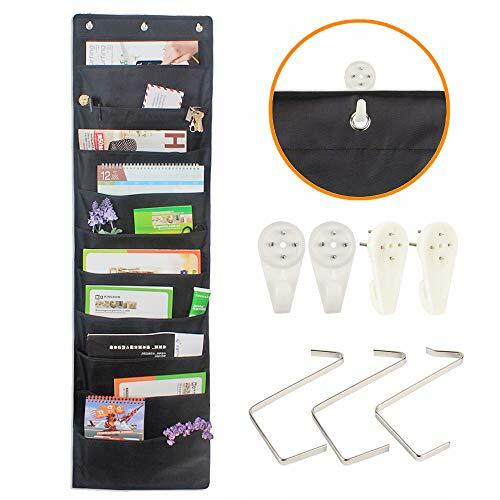 Multi Mounting Solutions: Comes with free 3 door hangers and 4 wall-hooks for easy hanging. For over the door scenario, hook the hanger to grommets and put it over the door.For wall mount scenario, hammer the hook built-in pins in wall. Perfect: For Teacher to plan and file works, For Student to organize homework, reference. For White-collar to improve filling system. Multiple-use scenarios like home, office, dorm room, or for classroom storage. Let each slot meaningful for your personal need. If you have any questions about this product by UNAOIWN, contact us by completing and submitting the form below. If you are looking for a specif part number, please include it with your message.